Salt Bay (4 m Redwood – Marsh Harbour, by Volksraad) looked on the way to higher honours when beating a handy line-up in the $10,000 Van Dyks Furnishers 1230 metres on 16 January at Rotorua. Below par at her previous outing, following consecutive seconds in two starts this time in, co-trainer Pam Gerard said: “She was not quite her usual self last start, with a cough afterwards, and had a bit of time between runs, but her work last Saturday was outstanding”. That outstanding piece of work was evident on the racetrack as ridden by Jake Bayliss she travelled nicely in third, quickened to a handy advantage at the 200m and stayed on strongly through the line to win convincingly. The daughter of impressive performing race mare Marsh Harbour (Volksraad), she was selected as a yearling by Paul Moroney for $25,000 at the 2016 New Zealand Bloodstock Select Sale, from the draft of Westbury Stud, and the pedigree has since received a boost through the deeds of year older sister Swampland (Redwood). Purchased a year beforehand for $82,500 by Victorian trainer Henry Dwyer, Swampland raced to four wins in short time before finishing second in the Let’s Elope Stakes (Gr. 2, 1400m) at Flemington, and in doing so gave the family a lift. It comes as no surprise that their dam, Marsh Harbour, has been able to leave athletic progeny with a good turn of foot, as she displayed plenty of talent in winning three of her 10 starts and included a second in the Desert Gold Stakes (Gr. 3, 1600m). Marsh Harbour is a three-quarter sister to Ginner Hart (Volksraad), a Group Three winner and Group One placed. Although taking time to mould into a racing proposition, Salt Bay had always indicated her ability to Gerard but a period of both physical and mental maturity was required in order get the best from her. A narrow defeat to subsequent three time winner Icebomb (Darci Brahma) saw her end the first campaign winless in six starts, but showing promise nonetheless, and on the back of a winter spell she has returned a more developed article. “It was a good win, but a bit overdue,” Gerard said. 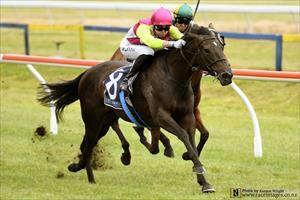 “We (Ballymore NZ) own her with Wayne Boyd and it’s great to get a win for him. He’s a great client and a delight to have in the stable. “She’s still got developing to do and not always the healthiest, as she seems to pick up coughs easily, which can set her back and things need to be right for her to perform, but when we do get it right she can be very good. “I still don’t think she’s quite there yet and has a bit to furnish, but she’s always shown a lot of potential. Whether she can get to top-class I’m not sure, but she’s got the ability and once she becomes more confident it should get easier for her. “She’s determined, but can get bumped around, off balance, and just needs more ring craft and confidence. On Dead ground, Salt Bay ran the 1230 metres in 1:14.4 and $7.80 & $2.00 on the NZ TAB tote. Sire, Westbury Stud Group One winning stallion Redwood (High Chaparral) made an immediate impact with his three-year-olds Night’s Watch and (stakes winner) Romancer each proving themselves above average and has sired over 30 individual winners. Salt Bay was strapped by Joline Visser.